Saffron plants need well draining soil and lots of sun. 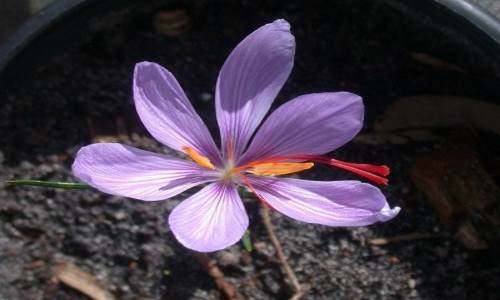 If saffron crocus is planted in swampy or poor draining soil, it will rot. Other than needing good soil and sun, saffron crocus are not picky. When you plant your saffron crocus bulbs, place them in the ground at about 3 to 5 inches deep and at least 6 inches apart. About 50 to 60 saffron flowers will produce about 1 tablespoon of saffron spice, so keep this in mind when figuring how many to plant. But, also keep in mind that saffron crocus multiply rapidly, so in a few years time you will have more than enough. After your saffron crocus bulbs are planted, they need very little care. They will be hardy down to -15 F (-26 C). You can fertilize them once a year, though they grow fine without being fertilized as well. You can also water them if the rainfall in your area falls below 1.5 inches per week. Growing saffron crocus is easy and certainly makes the expensive spice much more affordable. Now that you know how to grow saffron plants, you can give this spice a try in your herb garden.